In tandem with our generous partners RBC, and the cycling community, over $100,000 has been donated to our charity partners since 2014. These efforts continually aim to invest in youth participation in cycling and to empower and inspire our kids to live healthy lives. We are delighted to announce that this year, Cycling BC will be the official charity partner for RBC GranFondo Whistler. 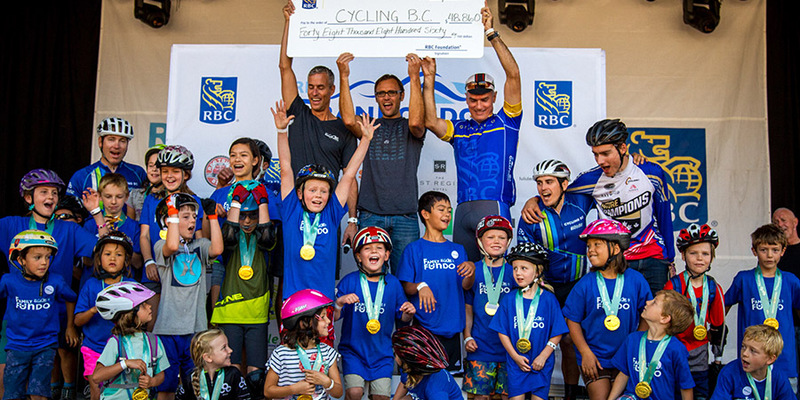 Through RBC GranFondo Whistler, riders will have the ability to donate to Cycling BC. RBC will match your generous donations, adding an additional $15k up to a maximum of $25k towards the iRide program. Continuing our focus on supporting youth within cycling, we are proud to again offer substantially discounted entry to riders under 19. Open for any category, entry fee is only $50. For families and with the help of Cycling BC, we bring iRide Jam to RBC GranFondo Whistler. Through group activities lead by qualified coaches, iRide seeks to increase knowledge about bike safety, develops smart decision making skills, and inspires children and youth to gain riding skills while increasing their fitness level. On September 8th, bring your kids up to Whistler to take part in this free family friendly activity. WHAT: Fun games and drills for kids 6+, free! From fun learning experiences for first time riders through to high performance coaching for our province’s top cyclists, Cycling BC is growing the sport of cycling for all ages and abilities. Together we can inspire our communities towards healthier, more active lifestyles.